The “Q.T.,” from an aerial photo by Chester Mullen taken between 1908 and 1915. Tehama Street runs along the bottom and California Street runs diagonally from the top to bottom. 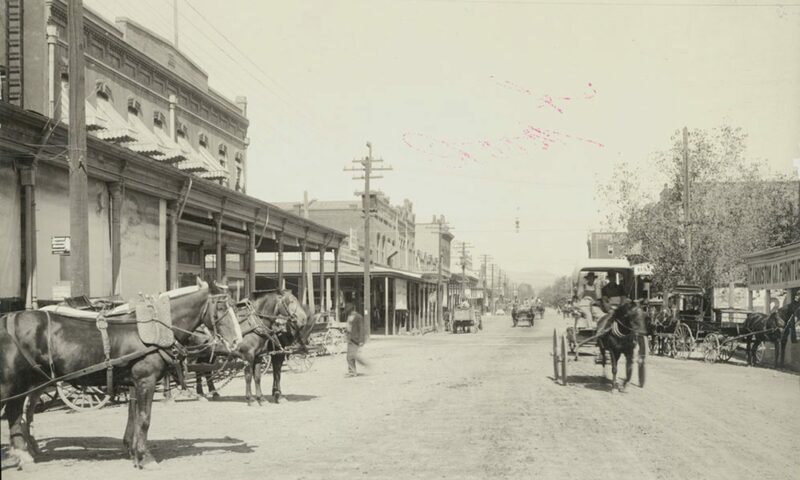 Courtesy of Shasta Historical Society. 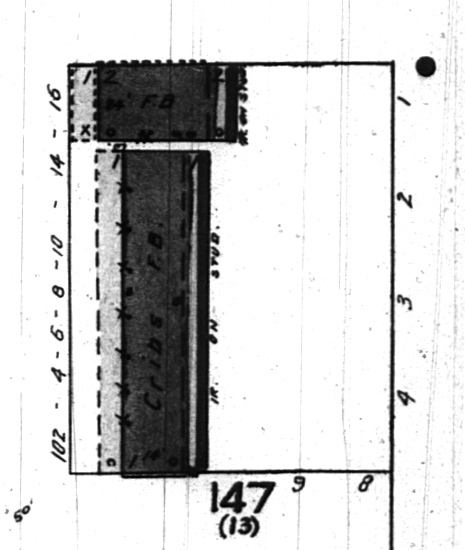 Block 13 as it appears on the 1912 Sanborn map. “F.B” or “female boarding” was the company’s euphemism for bordellos. As he did this, his female companion rushed upstairs and began to pour several gallons of liquor out of the second-story window into the alley. When the law realized what was going on, one officer tried to rush around and catch the liquor in an old washbasin while the other tried to break down the door. Both were unsuccessful and after a few minutes Peck unchained the door and invited the officers inside. Peck was arrested and taken to jail. He was before a judge the following morning, when bail was set for $250. Unable to make bail, Peck returned to jail. The county reports they have no records of a court case against George Peck in 1927, so perhaps he got off lucky. It’s not yet clear how long the firm of Chadwick & Freitas held onto the buildings but we know do know that by 1937, the building was listed in city directories as “The Bell Rooms,” suggesting a change of ownership. The Bell Rooms complex, viewed from the west, circa approximately 1930. This author’s research at the Shasta Historical Society revealed a photograph of the Shasta Street railroad crossing dated approximately 1930. The photo, the relevant part of which is reproduced to the right, shows the western faces of the buildings on Center Street. The two-story brick structure at this point still has a peaked roof as well as a porch shading the entrance. There’s a sign jutting out to the north reading “Bell Rooms transient.” To the south, the long, low-slung row of what were once cribs is still standing. At some point, the “working women” were finally expelled from this building and it became extremely low-end housing, as city directories from 1938 through 1942 list male occupants for those addresses. In the 1938 city directory, the manager of the Bell Rooms is listed as Betty Blake. In the 1939 directory, a Juanita Martin is listed as manager, and the Bell Rooms is listed as offering furnished rooms. Initial research has not found much on these women. By 1943, there are no listings for any inhabitants of the one-story building, though there is one account of the two-story building still housing red-light activities in the early 40s. 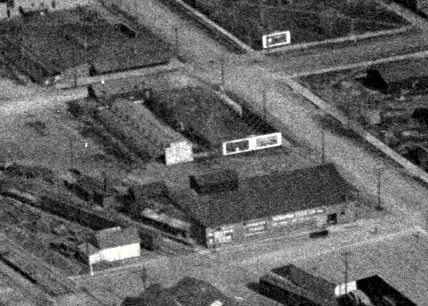 The Yellow Cab Company is listed as occupying the address of the one-story building in 1948, It is unclear if the building was leveled and a new one erected on its footprint, or if it was just adapted into today’s auto bays. It is probably around this time that Charles E. Bull, proprietor of the Yellow Cab Company, purchased the land and buildings and red-light activities ceased, if they had not already. By the 1956 city directory, the Bell Rooms was no longer listed as such, though individual listings indicated the building continued to serve as inexpensive housing over the years until very recently. Charles Bull held onto the property until the 70s, and died in 2007 at the ripe old age of 94. Stay tuned for the next installment about the lives of Chadwick & Freitas! Getting more interesting! Great story Mike. Can’t wait for the next one.